It stands to reason that during the summer, when the heat keeps you from the stove and the beach keeps you less clothed than normal, everyone’s thoughts would turn to eating light. That is not always the case though. Especially not when trips out of town, and the celebratory air that accompanies them, involve meal after bountiful meal, tables groaning with food, and everyone serving up their best or ushering you to favorite restaurants. I am, of course, very much up for this blissful challenge. The vegetables and fruit are going crazy with goodness right now, and if you’re vacationing on a tropical island (which, by the way, every one of our 7,107 are – so technically we all live on one) you’d be foolish to pass up on all the fresh seafood. My trip to Iloilo was definitely one of those aforementioned high-octane eating trips. We were surrounded by family, good food, and good wine. Every meal had us vowing that we would go light for the next one. And every next meal had us breaking that vow. This weekend I am off on another beach trip, this time closer to home and only a car ride away. But I know that again we will be spoilt with good food (and lots of it), good wine (lots of that too), and fantastic company (which makes eating all the more enjoyable don’t you think?). A little preparation is in order methinks. Just in time comes Heidi Swanson’s new cookbook Super Natural Every Day. I have long been a fan of 101 Cookbooks, Heidi’s gorgeous blog that has been feeding my inner vegetarian (yes, some of us carnivores do have inner vegetarians…it’s actually quite common so please don’t scoff). I was so happy to finally get my hands on her new book and it has been sitting on my bedside table since I got it…giving me little bits of inspiration before I nod off, thinking of ways to eat a little lighter and healthier to compensate of weekend feasting! – Place the chickpeas in a bowl. – Place a skillet, and, while it is still cold, add the olive oil, garlic, Piment d’Espelette, and two big pinches of salt. Place over medium heat and stir until the garlic starts to sizzle but does not brown. – Add the kamote tops and toss until they start to wilt. This will be very fast, just seconds. Stir in the lemon zest. 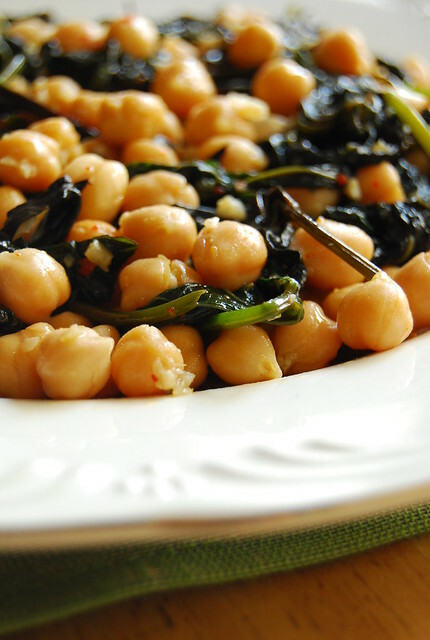 – Pour the whole lot of greens and flavorful oil over the chickpeas and toss to coat. Taste and adjust seasoning. Serve warm or at room temperature. – Serves 2 (as a main) or 4 (as a side). Heidi uses dandelion greens in her original recipe but, even if they sound quite charming to me (like something out of Aesop’s Fables), they cannot be found over here. I substituted kamote tops (sweet potato greens) of which I think Heidi would approve as she is a staunch supporter of locally sourced produce. For the red pepper flakes she calls for I used Piment d’Espelette (recently gifted to me by a beloved chef aunt who hails from the Basque region of Spain). To make this more a main meal Heidi recommends topping it with a crumbled hardboiled egg. I decided to go the runny route and topped mine with a Pimenton fried egg (my latest breakfast obsession that I will soon be posting about!). I have pretty much bookmarked Super Natural Everyday to an inch of its life but this simple preparation of garlicky-lemony chickpeas pushed itself to the forefront one lunchtime when I needed something fast and light, but still tasty and filling. This dish hits it on all counts. Especially on the tasty count. So a big thank you to the lovely Heidi, who provided me with this delicious respite between summer trips. I am looking forward to trying more! Just as I am looking forward to once again trading city for beach this weekend! I love your own adaptations to the original recipe–especially the runny egg! And now I'm intrigued by your pimenton fried egg, so I'm looking forward to that post. What a lovely dish! I'd love to taste sweet potato greens. Chickpeas are so delicious and versatile. I love them! Perfect meal for this time of year! This dish is right up my alley – it sounds so delicious. I love Heidi's new book! i like it, your notion of the 'inner vegetarian' 🙂 This sounds like a great recipe! And I love Heidi's recipes as well. So honest and delicious. Hi Anh! It's true! I could never be an "outer vegetarian" (I like pork too much) but I have a very assertive "inner vegetarian" that demands attention! This dish looks delicious! Thanks for posting! I adore chickpeas, this dish sounds right up my alley! Can't wait to try them out..I like the recipe..
Hi Marvin! I’ll be posting about the pimento fried egg soon! It’s me new favorite way to have eggs! Hi Tina! Hope you like it!